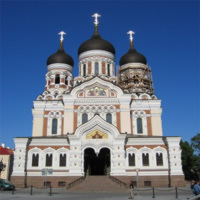 Founded in 1154, Tallinn is the oldest capital in Northern Europe. Its Old Town is one of the best preserved Hanseatic town centers in the world (listed the UNESCO World Heritage Sites List). 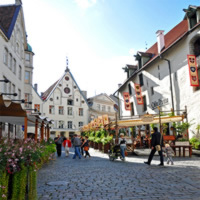 Here you`ll find original cobblestone streets dotted with medieval churches and grandiose merchant houses, barns and warehouses many of which date back to the Middle Ages. It boasts a town wall with 26 defense towers, the Dominican St. Catherine`s Monastery founded in 1246, the 600-year-old Gothic Town Hall, the world`s oldest functioning pharmacy on the Town Hall Square and the 159 meters high Oleviste Church which was the highest structure in the world in the 16th century. A stone`s throw away you`ll find the city`s business center with modern towers and luxurious hotels, trendy neighborhoods and large shopping centers. Tallinn`s luring coastline dotted with promenades and sandy beaches is especially rewarding during the summer but offers scenic views of the iconic cityscape throughout the year. The St Petersburg hotel was NOT at all what the pictures showed. The rooms were about 1/2 the size along with the entire hotel itself.